Below : Serial pest Neil Erikson interrupts a Channel 7 broadcast from Bourke Street yesterday. ALA candidate Avi Yemini also sought to capitalise upon the tragedy, today holding a smol rally at the site. This political opportunism is explored by the Online Hate Prevention Institute in Bourke Street Attack November 2018. Outside court, Mr Erikson said Mr Turner, aka “Ricky T”, planned to stand as a political candidate for a yet-to-be established far-right political party called Cooks Convicts with a focus on “Australian values”. 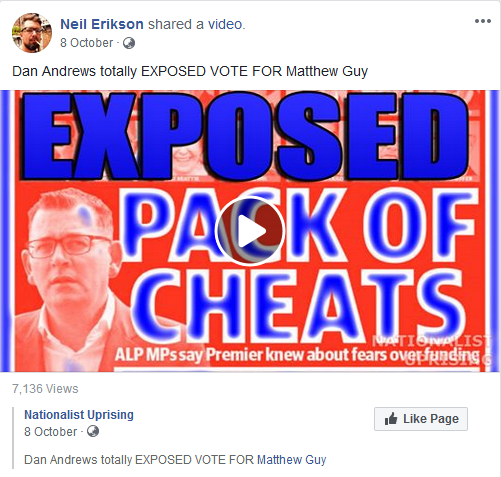 He said he hoped the group could register before the November Victorian election, but couldn’t confirm which electorates they would contest. “We’re going to be running on old-school, anti-PC policies,” Mr Erikson said. Susan Jakobi is running for the Australia First Party in the seat of Cranbourne as an independent (the party is not registered in Victoria). Jakobi contested the federal seat of Lalor for the party in 2016, gaining 3,232 (3.0%) votes and placing fifth of five candidates. The overall fall from 545 to 507 candidates masks a significant shift to the left in the party composition of nominations. Three small moral conservative parties that contested the 2014 election are no longer registered, Family First, Rise Up Australia, and the Australian Christians. Family First and parts of the Australian Christians have been absorbed by [Cory] Bernardi’s Australian Conservatives, hoping to improve conservative prospects of winning Senate seats at the next federal election. The absorption of Family First into the Australian Conservatives was also a consequence of former Senator Bob Day’s departure from politics. Despite having registered for the 2018 election, neither the Australian Conservatives nor Pauline Hanson’s One Nation have nominated candidates for the election. This leaves a hole on the right of Victorian politics that may boost the Coalition primary vote but will have little other impact on the overall result. *Wilding stood as a candidate for the Secular Party for the seat of Melbourne in the 2013 federal election and with 230 votes (0.27%), Wilding came 12th of 16 candidates. The ALA is also running a candidate, Siobhann Brown, in the Lower House seat of Yan Yean. As for the Victorian Socialists, they’re running candidates in no fewer than 15 districts: Bellarine (Jackie Kriz); Broadmeadows (Jerome Small); Buninyong (Jane McKendrick); Geelong (Sarah Hathway); Lara (Dean Cardigan); Lowan (Trevor Grenfell); Melton (Ron Guy); Pascoe Vale (Gerry Beaton); Polwarth (Brendan Murphy); Preston (Stephanie Price); Ripon (Bronwyn Jennings); South Barwon (David Ball); South-West Coast (Terry Riggs); Thomastown (Kath Larkin) and; Wendouree (Jeremy Smith). While the Socialist Alliance and Socialist Alternative have thrown their weight behind the Victorian Socialists, sadly, the Socialist Equality Party (which ran four candidates at the 2015 NSW state election), will not be running any candidates at this election (and has denounced the Victorian Socialists as ‘pseudo-left’). Solidarity, for its part, took note of the Victorian Socialists in a recent article on the election. This entry was posted in Anti-fascism, History, State / Politics, That's Capitalism! and tagged 'Tiny' Avi Yemini, 2018 Victorian state election, Australia First Party, Australian Liberty Alliance, Avi Yeminem, Ban Islam Party, Cooks Convicts, Daniel Jones, Daniel MacDonald, David Sydney Maddison, Ewan McDonald, Indhira Bivieca, James Wylie, John Bolton, John Reisner, Kaylah Jones, Kenneth Nichols, Lobster Guy, Mark Brown, Neil Erikson, Online Hate Prevention Institute, Ralf Schumann, Ricky Turner, Rikki Turner, Royston Wilding, Russell Gomez, Siobhann Brown, Susan Jakobi, Tactical Force Combatives, Victorian Socialists. Bookmark the permalink. Having examined the Group Voting Tickets for the Northern Metropolitan Region, I must say I’m stunned by how well the Victorian Socialists have fared. Of course, without a substantial primary vote they’ll be eliminated quickly, but if they pick up 4 or 5%, things might get interesting. I’d been predicting 6.7% (i.e. 0.4 quotas) as the necessary minimum, but now I’m not so sure.